A Valuable Investment...In continuous production since the 18th century, Lowcountry coil basketry is one of the oldest crafts of African origin in America. Today, baskets are purchased by museums and art collectors throughout the world, such as the Museum of American History at the Smithsonian Institution. Each basket reflects the artist's skill as both designer and technician. A basket's value increases with age and with proper care it will last indefinitely. 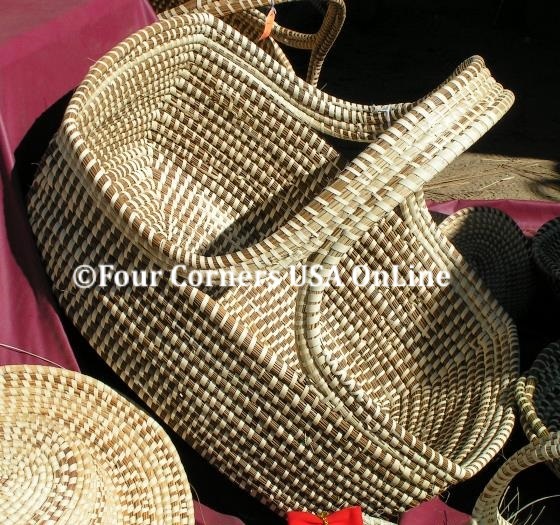 Examples of Lowcountry coil basketry exist that are well over a century old. The Tradition... During the days of slavery, rice cultivation and the flourishing plantations of the Old South, these baskets were in great demand for agricultural purposes. They also brought extra income to slave owners, who often sold baskets to other plantation owners. During this era, large work baskets were popular. For the most part, they were used to collect and store vegetables, staples, etc. Men made these large baskets from marsh grasses called bulrush. A common form to evolve was the winnowing basket (rice basket) called the "fanner". Other agricultural baskets were for grain storage, cotton, fish and shellfish. Functional baskets for everyday living in the home were made by women. Some of these were made for bread, fruits, sewing, clothes, storage, etc. They were made from the softer, pliable grass commonly called sweetgrass (Muhlenbergia filipes), because of its pleasant fragrance, similar to the smell of fresh hay. With the decline of the plantation system, black families acquired land and started a new way of life. Because they felt that this basketmaking tradition was an important part of their cultural heritage and that future generations would be able to retain an identity with Africa through the baskets, they kept the tradition alive. For generation, it has been passed from mother to daughter to granddaughter. Technique...These baskets are skillfully woven in a continuous,single "rope" and simultaneously"sewn" using strips of palmetto leaves. The process is very tedious and time consuming. Caring for your Sweetgrass Basket...Because the grasses used in these baskets are from swamps and marsh areas, water will not harm them. With a soft brush or cloth, they can be carefully washed in soapy water and rinsed thoroughly in cold water. They should then be air dried. This is the only care they require. While working with one of our Jewelry Designers many years ago, he introduced us to several friends who made traditional Sweetgrass Baskets. The relationships lasted for years and we were able to include these wonderful treasures on our Show Tours both to sell for the weavers and use for jewelry baskets in our display. It was a joy to get such personal attention from these weavers with up close demonstrations of workmanship, technique and most importantly to learn the plight of diminishing raw materials to create these traditional masterpieces. As we migrate this portion of the website, we will offer the balance of this collection for sale in our store. Thank you in advance for your patience.